Former Iowa Governor Tom Vilsack says he wants to come back to Iowa and he isn’t ruling out another run for political office. Vilsack has served in President Obama’s cabinet since January of 2009, as the nation’s ag secretary. Vilsack, who grew up in Pennsylvania, met Christie Bell of Mount Pleasant, Iowa, in college and adopted her hometown as his own after the couple married. 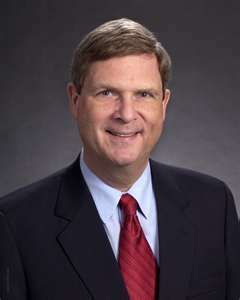 Vilsack was elected mayor of Mount Pleasant and won a seat in the state senate before being elected governor in 1998. Vilsack won reelection in 2002, but did not seek a third term, saying eight years was enough. He’s not ruling out the idea of putting his name on an Iowa ballot again, though. Vilsack says he is not interested in continuing to serve as the nation’s ag secretary if Hillary Clinton wins the White House in 2016. Teaching at a university would be of interest to Vilsack after his time is done at the U.S.D.A., but Vilsack says he is not interested in becoming the next president of the University of Iowa. Vilsack made his comments during taping of the “Iowa Press” program that will air this coming Friday night on Iowa Public Television.